This necklaces bundle is perfect as gift for your bridesmaids. You can choose the 5 Necklaces or 7 Necklaces bundle. Necklaces are handmade and totally customizable: you can choose your favorite butterfly colors. 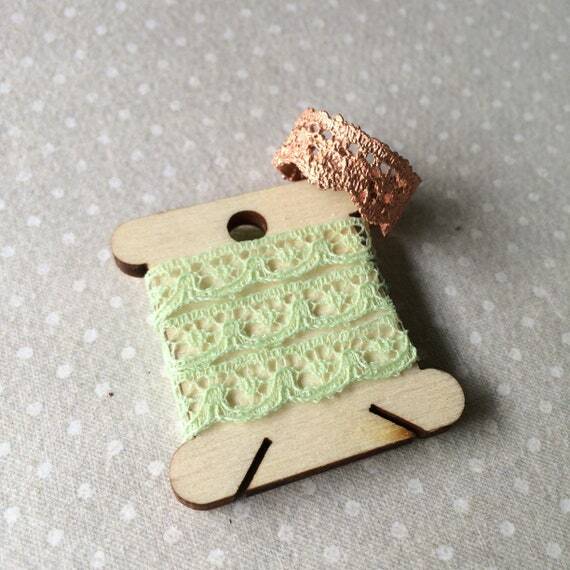 The pastel necklaces bundle in pictures is just an example, use your imagination! Please pay attention wearing necklaces. They’re very delicate. Don’t stretch butterflies. There are 6 butterflies on each necklace and they measure from 4 to 7 cm wingspan. Silver chain is long 43 cm (17 inches) with lobster clasp. I dreamed of making lace jewelry for years and I realized my dream by discovering the electroforming technique. This lace ring has not been cast from a mold but it has a thin coat of copper, over an original vintage piece of lace, making it a one of a kind creation! Electroformed jewelry should be treated with care. It is fragile and it is not designed to be twisted or bent. Please remember to remove the ring before washing your hands, bathing, exercising, cleaning or sleeping. My jewelry has not been sealed with paint or other sealant. This ring will fly to you with registered tracked airmail by Poste Italiane shipment service. 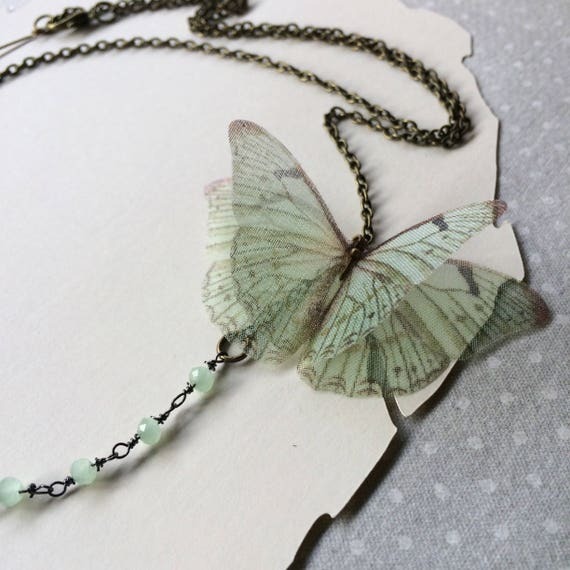 Lovely handmade necklace with beautiful silk organza seafoam green butterflies. Antique bronze/beaded chain is long about 60 cm. (23.5 inches) with lobster clasp. The central part of the necklace is created with crystal seafoam green beaded chain. 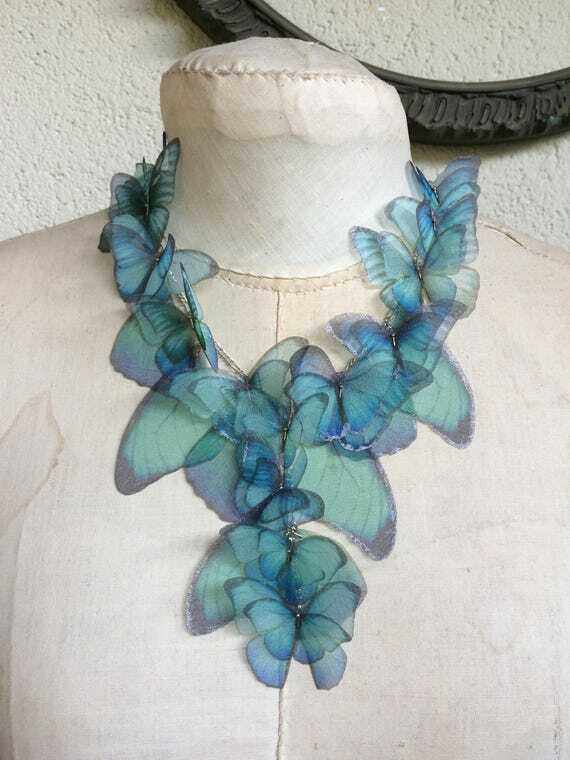 A special necklace, completely handmade with silk organza Morpho butterflies in shining aquamarine green blue shades. I chose butterfly images one by one, from real pictures and vintage illustrations. Then I printed them on high quality silk organza, handcut, sealed and fixed on a silver (or antique bronze) finish figaro chain. There are about 37 bright aquamarine Morpho butterflies and wings on this necklace, and each one measure from 5 to 9 cm. The chain is long about 45 cm. (18 inches) with a frontal pendant of 8 cm. 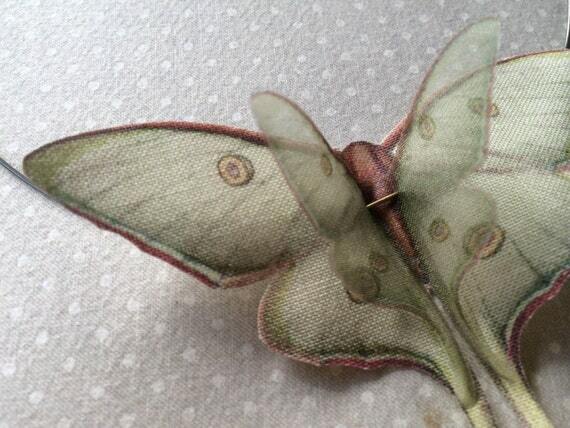 where butterflies and wings are hanged. Steel wire with handmade clasp. Circumference about 45 cm. (18 inches).